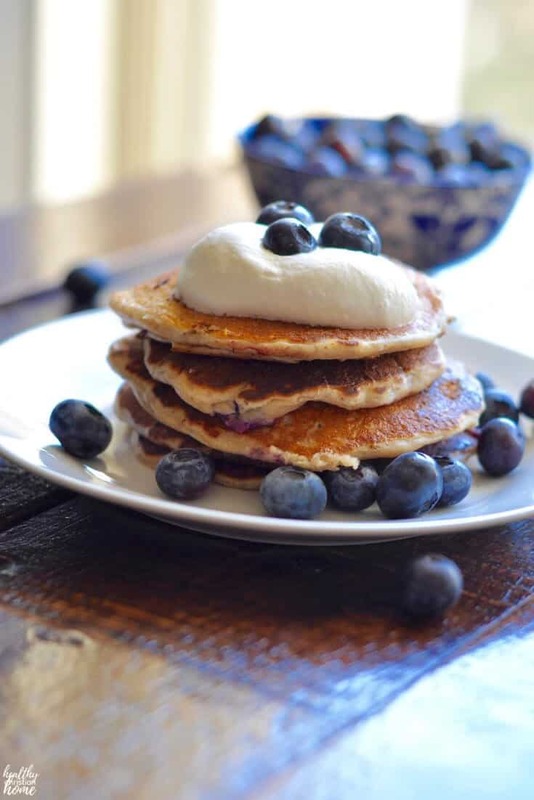 These soaked blueberry yogurt pancakes have tons of flavor while still being gut-friendly! 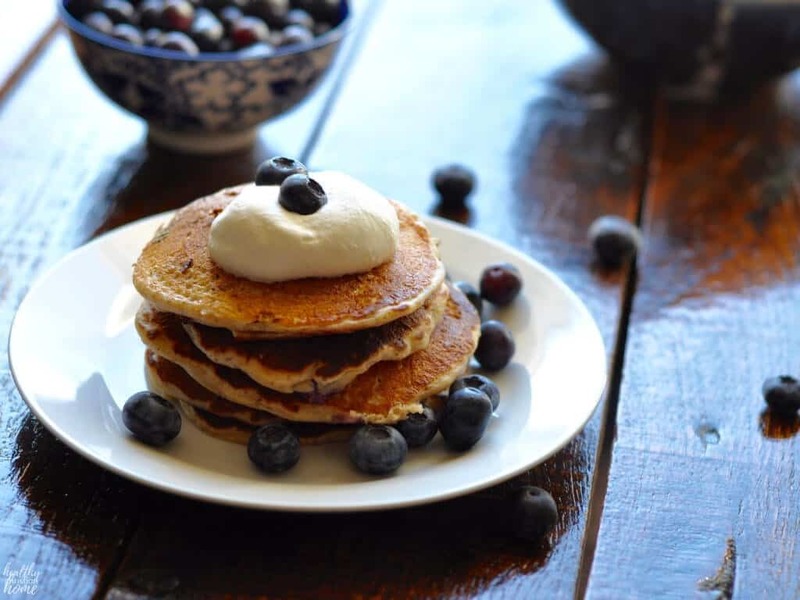 Overnight soaked pancake mix and the addition of yogurt make these pancakes super healthy. Fresh blueberries and a hint of lemon make them super yummy! Last Saturday, I was delighted to find gorgeous blueberries at ALDI for $1.79 a pint, so I had to whip up some blueberry pancakes! It’s sometimes hard to find nice berries during the winter, so when you find them, you take advantage of it. 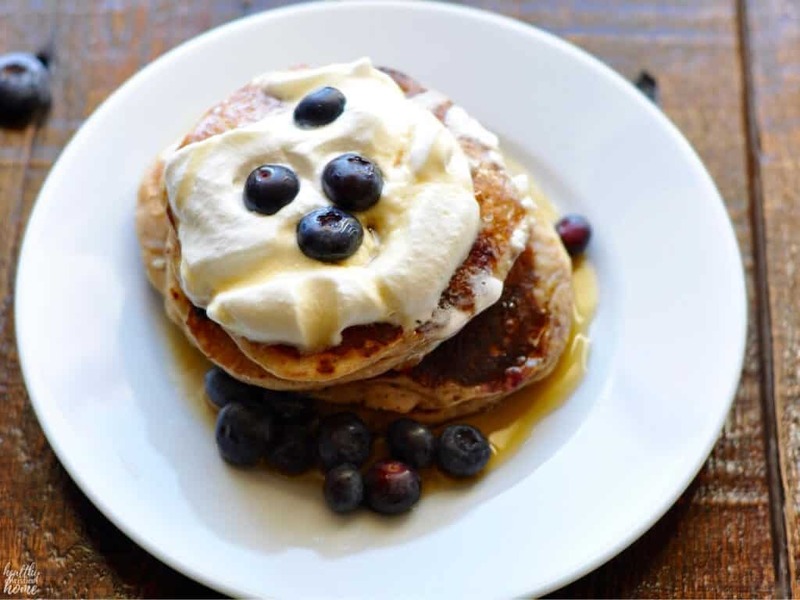 These pancakes are super healthy too, because the flour is pre-soaked (more on that in a minute) and they contain greek yogurt. 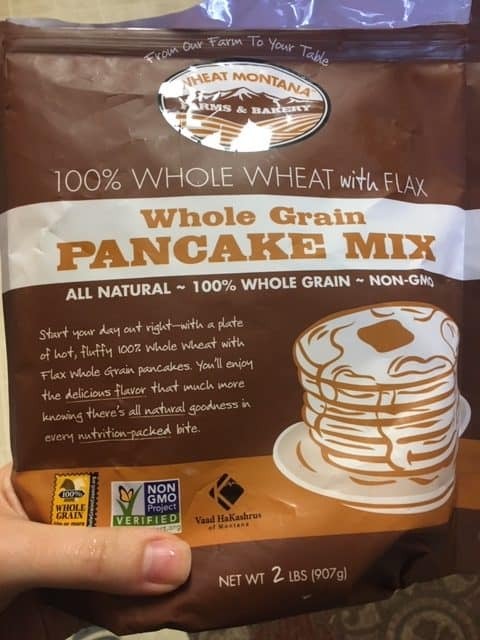 You can find their pancake mix and Prairie Gold flour (my fave!) at some TJ Maxx, Marshall’s, HomeGoods, or Wal-Mart locations. You can ask your local Wal-Mart to ship it in if they don’t currently carry it. This post is sponsored by Wheat Montana. All opinions 100% my own. Did you know it’s possible to make wheat products that are — gasp — healthy? With all the gluten-free hype these days, we sometimes forget that freshly ground, properly prepared wheat is actually good for us. The main problem (and possibly one reason why many people don’t tolerate gluten) is that we don’t prepare our wheat properly in today’s world. Our food habits are centered around convenience and speed. Nutrients are stripped out of whole grains, leaving white flour that’s hard to digest and void of nutrition. It’s true, phytic acid in wheat flour prevents us from absorbing all the nutrients and making it more difficult to digest. But thankfully, there’s a simple solution to this problem – overnight soaking! Soaking has been practiced for centuries by many cultures. Here’s a quick run-down: when you soak a grain (flour, rice, etc.) for 8-24 hours in an acidic liquid, the acid neutralizes the phytic acid. This allows for easier digestion and better absorption of minerals. Acidic liquids include things like buttermilk, yogurt, apple cider vinegar, or (in today’s recipe) lemon juice. I’m so glad my mom introduced me to the Nourishing Traditions book by Sally Fallon, which explains this concept in detail. Check it out if you haven’t already! For this recipe, we’re using lemon as our acid of choice which is added to milk for soaking the flour. 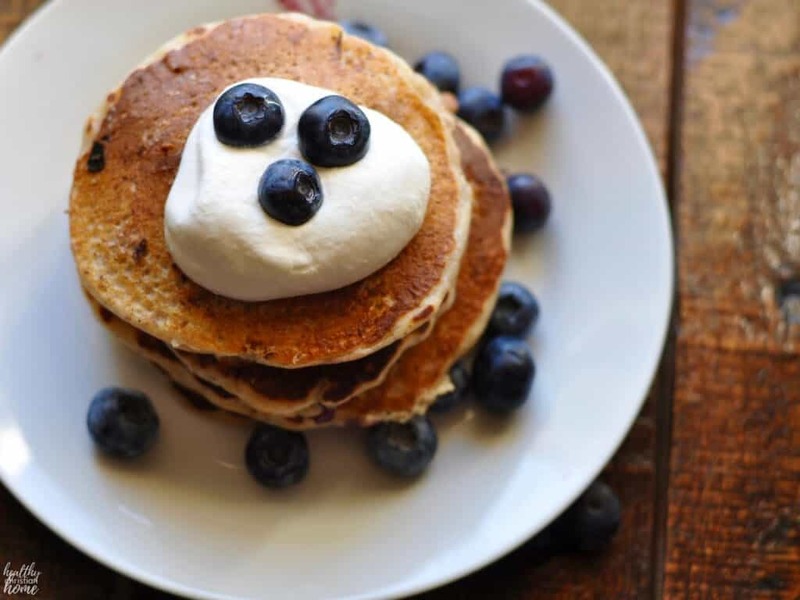 Lemon and blueberries are best friends – they really enhance the flavors in this pancake recipe! I’m also using Wheat Montana’s pancake mix, but you can use plain flour and then add 2 tsp. baking powder, 1 tsp. salt and 1 TBSP sweetener when you’re ready to cook. Make sure to grease your griddle or skillet really well before cooking – I forgot this step! Oops! The soaked pancakes hold their shape really well. This pancake mix obviously contains some leavening agent, but I added a bit of baking powder before cooking since soaking can make the leavening somewhat less effective. I used whole milk for soaking, but you can also use a dairy free milk like nut milk or coconut milk. Use this as a basic pancake recipe and add any fruit or flavorings you wish – or leave them plain. 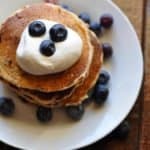 I hope you enjoy these pancakes as much as we do! 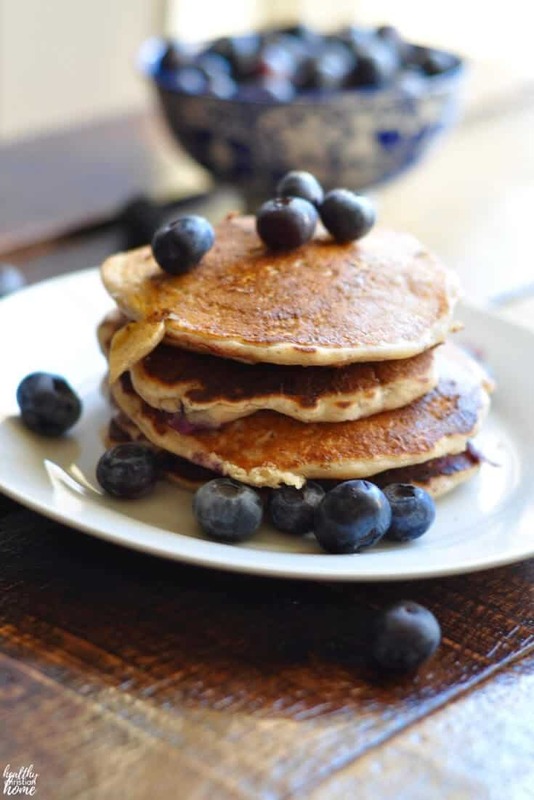 These soaked blueberry yogurt pancakes with a hint of lemon have tons of flavor while still being gut-friendly! The night before you make your pancakes, add pancake mix (or flour), milk, and lemon juice to a large bowl. Mix well and cover lightly. Let rest 8-24 hours. Preheat griddle or skillet to medium-high heat and grease well. In a mixing bowl, combine yogurt, egg, baking powder, vanilla, and oil. Add to soaked flour mixture and stir well to combine. If batter is too thick, add milk a little at a time to reach the right consistency. Pour batter onto skillet, 1/3 cup at a time. 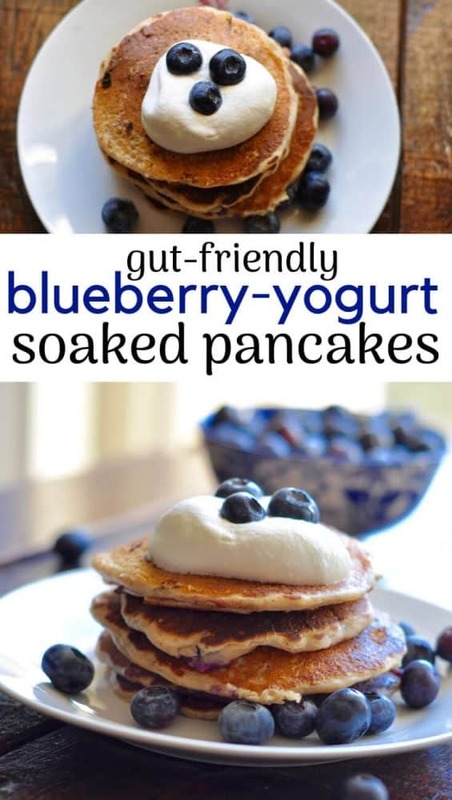 Sprinkle each pancake with blueberries. When the pancake is covered in bubbles, flip and cook for several minutes until underside is brown. Remove from skillet and serve warm with maple syrup, butter, or whipped cream. Instead of pancake mix, you can use plain flour for soaking and then add 2 tsp. baking powder, 1 tsp. salt and 1 TBSP sweetener when you’re ready to cook.